Special thanks to Creative Cow, Adobe and FMC, who supported and publicized this effort, and helped to make it a priority in an industry event known for, well, a lot of “Vegas booth babes.” Prior to the event, we pulled together some dismal statistics across the industry. But we also talked about solutions. I was thrilled by the number of men in the packed room, the number of millennials ready to tackle this challenge, and the interesting and continued commentary online afterwards (primarily on Twitter—see #postgendergap). Please pass the link along and share your solutions using the #postgendergap hashtag. Take Names Off Resumes. All of us have bias, and it’s not just gender-related. So give yourself and your company the advantage of finding the best person for the job by removing bias in the hiring process. There’s all kinds of data to back this up, by the way. A University of Melbourne study showed that people with “simple” names were promoted more easily. In other words, people with less ethnic-sounding names. A University of Ohio study showed that women with more feminine sounding names had less career success in traditionally male jobs. And a Wharton study using mock email addresses with 6,500 professors at 259 top US universities found them more likely to meet with and mentor students with white male names. Promote Experienced Men and Women Based on Performance not Style. Once we get into the higher ranks of leadership, the tables turn. The very leadership qualities that make someone effective—being bold, being assertive—are often held against women. Women need to be more choosy about when they are assertive, or they will be perceived as not team players at best, b*tches, or worse. As an employer you can change this by promoting women and men for the job they accomplish. Period. On the flip side, if you are a woman, you’re going to need to be more assertive about asking for more pay. But somehow do it in a way that isn’t b*tchy Hmm. This strikes me as forcing women into some kind of no-win situation regarding what kind of “style” they will present in the workplace. So how about promoting based on performance? Hand Out Clean-Up Jobs Equally. Invite Women to the Party. Study after study has shown that women tend to be asked to get coffee and clean up after meetings, no matter what their role. It’s easy to change this. Post a sign in the office kitchen: “This week’s kitchen boss is…Bob” and rotate among all your employees equally. The flip side of this coin is making sure women int he office are invited to after-hours happy hours and meetups the same way men are. Only then can they be seen as colleagues and friends, and develop personal relationships with mentors. Put Women on Stage. At conference after conference that I attend in the tech and media industries, there is just one token woman on the stage as a speaker. Surely we can find more women for these high visibility posts? 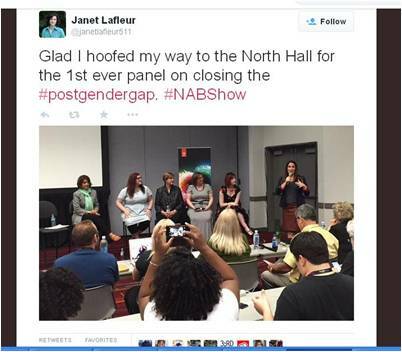 Conference planners, look for women to speak. And reach out to groups like Innovation Women, which offers a women-in-tech speakers bureau. We’re out here. So the onus is on you to change the balance on stage at your next event. Amy DeLouise is a multi-media director, producer, speaker and author in the media/content industry. She’s happy to bring everyone coffee on the set, as long as someone invites her to the happy hour after the shoot.